Delivery service between Gold River and Campbell River. 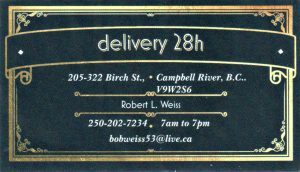 Regular delivery days are Wednesdays and Fridays, leaving Campbell River each day at 10:00am and heading to Gold River. Rates start at $15.00 (up to 40 lbs). $25.00 (up to 100 lbs). Rates then go up by $10.00 per 100 lbs to a max of 1200 lbs..
Dry cleaning rate ($15.00) is for transport both ways. Dealing with White Hat Cleaners. Please drop of dry cleaning at the Gold River Deli. 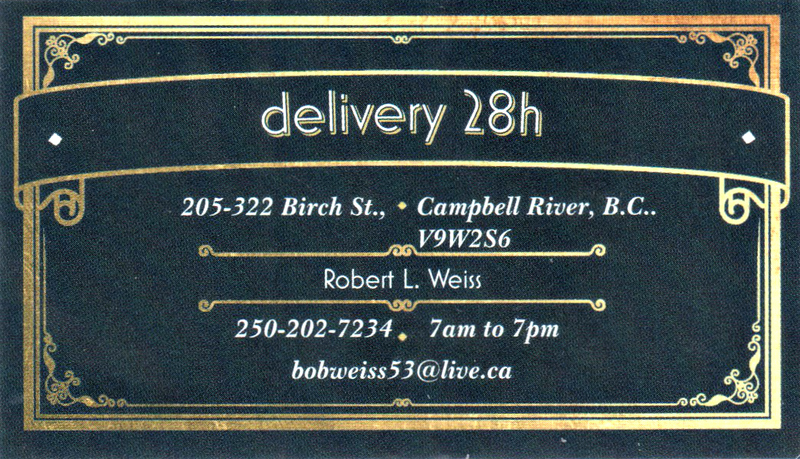 Phone 250-202-7234, email at bobweiss53 [at] live [dot] ca and follow me on Facebook: Delivery Hwy 28.